Well well well - looky there! 2nd place. Not my strongest image IMO, but I'll take it! Thanks everyone for the votes and comments. Excellent shot, congrats on your first ribbon! Great composition on this beauty, congrats on winning the red ribbon! Congrats on the ribbon! Wahoo! Great shot! Well it's about time! You were way overdue, and this one had ribbon written all over it in neon lights. Congrats! a ribbon a ribbon!!! Congratulations!!!!!! This was my favorite! I'm so glad it ribboned :) Congratulations! Yay, congratulations with a fantastic shot, and your first ribbon! You'll get plenty more, mark my words! after all this rime you ribbon with a 6.6, funny how that works. this is a very simple vegas shot. i like it alot. congrats. Great job... I love how the 'restaurant' neon sign in the background isn't lit up. That would have been a major distraction to the shot. Nicely done! I knew this one would ribbon! :D Still one of the most uncluttered Vegas shots I think I've ever seen. Great job! Dude! Congrats! 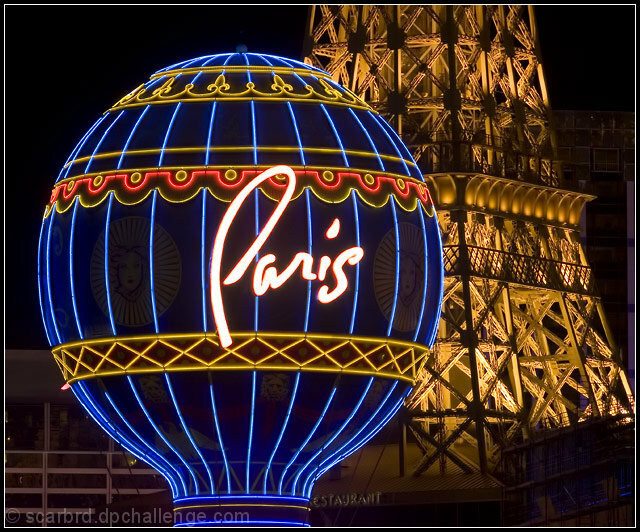 Las Vegas is one heck of a place to be for a neon challenge. Congrats David. A very well composed picture. David, Congrats on your ribbon!!! You still want to be known as that guy who doesn't have a ribbon? :P. Congratulations again. A lovely capture that packs a very big eyefull. Congratulations on your RED. Congrats on your first ribbon! Vegas - it's gotta be the place for neon. Well done. Congrats on your first ribbon! Well-deserved for a beautiful composition. Great work! My no. 1 choice. Awesome job man. Great showing! Nice shot, A bit tight on the crop, but it has personality! Colors compliment each other very well and composition is great. A real winner for me. You should be proud. this is a good sharp shot, the only distraction is the building in the bottom left, I don't no if it would have been possible to take the shot from a lower position, looking a little higher up the tower, and loosing the building on the left, it just looks modern, and out of place, still a very good shot. Proudly hosted by Sargasso Networks. Current Server Time: 04/22/2019 08:04:37 PM EDT.